The days are getting longer and soon we won’t be able to hide underneath our winter hats. As we put our winter layers away, it’s time to also shape up our hair for spring. It’s been sitting under a hat for months and probably has been somewhat neglected as far as styling goes. 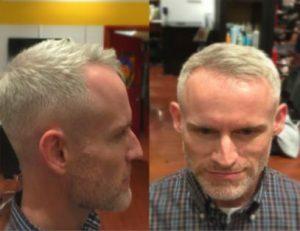 Make that appointment with your XEX Stylist to get trimmed up and looking sharp for the warmer weather. 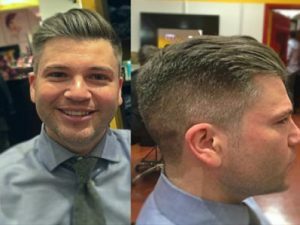 Here are some of the top men’s hairstyling trends this year. This look is sharp looking, but still easy to manage. 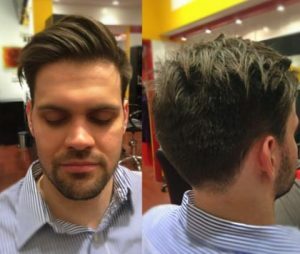 It’s all about the close-to-skin taper on the sides with a little bit of length left on top. Have your stylist texturize the top of your hair so you can achieve a piecey look. To style this look at home, pick up some Aveda’s Grooming Clay. Put a tiny amount in the palm of your hands, rub them together and apply as desired. This look is perfect for those of you who prefer slightly longer styles. 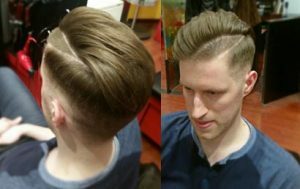 Still easy to manage, this hairstyle keeps the front of your hair longer and tapers down the back and sides. While the front looks a lot longer, it’s still textured and cut short to keep it easy to style in the morning. Aveda’s Thickening Paste is the perfect product for this style. It will help create that thick looking “pompadour” style, but is lighter than grooming clay to prevent from weighing down your volume. 2017 is still keeping it classic with traditional men’s styles such as the pompadour and the quiff, but it’s time to spice it up. This time, it’s all about faded sides and hard parts. Designs (especially on your part like pictured) are a great way to maintain a classic look with a bit of edge that’s still relatively office friendly. Depending on the kind of hold, shine and control you like, you can use any of the Aveda’s Pure Performance Line for styling. Talk to your XEX stylist about which product will best suit your hair type. If you’re someone who’s not big on the faded look, this is the hairstyle for you. It keeps the sides tapered in while still maintaining the length. Meanwhile, the top is kept even longer to style it back. For this style, a matte finish is usually best to get this look. Aveda’s grooming cream, thickening paste or grooming clay would work best depending on the type of hold you’re looking for. That’s right, 2017 is all about brightening your locks. Whether it be for bright, bold shades or something more neutral, don’t be afraid to step out of your comfort zone. 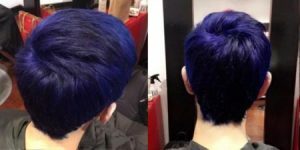 For hair color, your stylist is the most important person to talk to before you make the plunge. They’re here to help and guide you to the look that best represents you and fits with your lifestyle. So, there you have it. 2017 is all about bold cuts, edgy styles with classic roots. Don’t hesitate! Book an appointment today to welcome in the warm weather! What are you waiting for?